Evora wins men's triple jump gold at 2008 Beijing Summer Olympics. World and now Olympic triple jump champion Nelson Evora said he knew he would produce a 'big jump' in the final because the conditions were right. 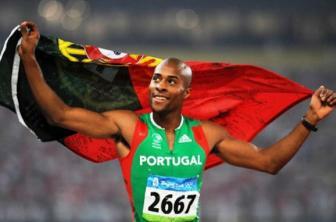 This is the first Olympic Gold Medal in 12 years for Portugal and only the third gold medal for Portugal in Track & Field ever. Evora, who became a Portuguese citizen in 2002 after previously competing for the Cape Verde Islands, established a personal best and set a new Portuguese record with a triple jump of 17.74 meters at the World Championships last August and finished 3rd at the IAAF World indoor Championships in Valencia this year. Evora won the Olympic gold medal with a jump of 17.67 meters on his 4th attempt beating silver medalist Phillips Idowu of Great Britain by 5 centimeters (17.62 meters). Leevan Sanders of the Bahamas won the bronze medal with a triple jump of 17.59 meters. Although Nelson Evora was one of the favorites heading into the Beijing Olympics, for him, the triple jump victory at the Olympics validates his surprise win at the 2007 World Championships. At the 2007 World Championships last August in Osaka, Japan Evora won the event with a jump of 17.74 meters both a personal best & Portuguese national record. Leading up to the 2008 Beijing Summer Olympics Men�s Triple Jump World Champion Nelson Evora said he felt no pressure going into the opening rounds of Olympic competition and expected to improve upon his personal best of 17.74 meters. Weather conditions at Beijing's Bird's Nest Stadium most likely kept Nelson from achieving a new personal best at the Olympics. But in the end, his 4th jump of 17.67 metres in the triple jump Olympic finals was good enough to win Olympic Gold. Nelson Evora became the triple jump World champion at the 2007 World Championships, in Osaka, Japan, estabilishing his personal best, Portuguese national record and second best world mark of the year at 17.74 meters. Nelson Evora competed in the triple jump in the 2004 Athens Olympics, without progressing from his pool, then finished sixth at the 2006 IAAF World Indoor Championships. He finished fourth in the triple jump final and sixth in the long jump final at the 2006 European Championships in Gothenburg, while setting a Portuguese triple jump record of 17.23 metres during the qualification. At the 2007 European Athletics Indoor Championships Nelson Evora finished in fifth place. Nelson Evora became the triple jump World champion at the 2007 World Championships in Athletics, in Osaka, Japan, estabilishing his personal best, Portuguese national record and second best world mark of the year at 17.74 meters. Nelson Evora placed third in the triple jump competition at the 2008 IAAF World Indoor Championships by jumping 17.27 metres. At the 2008 Athens Grand Prix, Nelson Evora won the men's triple jump with a successful jump or 17.23 meters. Evore finished first and ahead of world class competition (Marion Oprea, Kaba Badji, Arnie Giralt, Pavlos Galaktiadis. At the 2008 World Championship in August Nelson improved his personal best to 17.74 meters in the triple jump. "Yes of course because before I was just one more athlete and after this all the other athletes look at me with more respect and that�s important for the athletes when the others respect you and now when I go to the competition I feel great and I can see the other people the other athletes respect me and they stay and look at me what I can do." "Yes, I can see, I can other athletes because . . . "
"I feel that that technology is being developed� not being developed as such, perhaps it has already been developed but athletes are yet to realize its full potential. By adopting it they will become more aerodynamic. Maybe it is also helpful in terms of weight and movements. That could be very helpful too. In my case it helps, I use it daily during training and have become fully adapted to it. 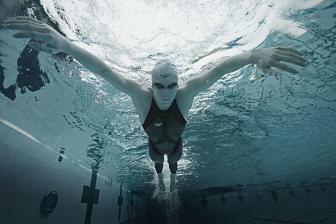 It is a matter of time, I feel that athletes will eventually adopt this type of Tech fit suit." NBC 2008 Beijing Olympics Set Record as Most-Viewed Event in US TV History. NBC Universal's Beijing Olympic coverage was viewed by more Americans than any event in U.S. television history, according to data provided by Nielsen Media Research. NBCU's coverage reached 214 million total viewers, shattering the previous mark set by the 1996 Atlanta Olympics (209M) by five million viewers and surpassing the 2004 Athens Games (203M) by 11 million viewers. Kenya's Samuel Kamau Wansiru Sets New Olympic Record to Win Beijing Olympics Marathon. Samuel Kamau Wansiru of Kenya set a new Olympic Record in the marathon with a time of 2:06:32 to win the Beijing Olympics Marathon. 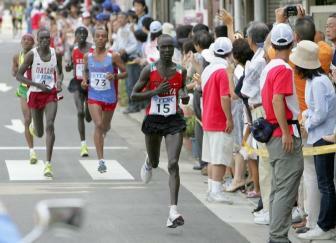 Wansiru is the first marathoner representing Kenya to ever win a Men's Marathon at the Olympics. The United States defeated Brazil by a score of 1 - 0 in the 2008 Beijing Summer Olympics women's soccer final. The only goal of the match coming in the sixth minute of extra time (96') from Carli Lloyd. Lloyd blasted a left-footed shot from outside the box that caught the lower left-hand corner of the goal. This year's Olympic Marathon is even more difficult to predict given the deep field of highly talented runners which is compounded by the summer heat, humidity and often-talked about Beijing pollution. If Beijing's pollution is to play a part in these Olympics, the Men's Olympic Marathon race is the likeliest of candidates to be impacted. Oddly enough, the fastest time run in an Olympics Marathon was at the 1984 Los Angeles Summer Olympic Games. Los Angeles is known for its notorious smog conditions. Dayron Robles claimed Olympic gold in the 110m hurdles in Beijing. The 110-meters hurdles event took place without former World record holder and Athens 2004 Summer Olympics Gold Medalist Liu Xiang of China who pulled out due to injury. Robles went on to comfortably win the gold medal, posting a time of 12.93 seconds in the Men's 110-meter hurdles final. Nastia Liukin earned her fifth Olympic medal, a silver medal in the balance beam final, on August 19 at the 2008 Beijing Summer Olympics. Nastia's most impressive victory was in the much coveted women's individual all-around gold medal. She barely beat fellow American Shawn Johnson by 0.6 points. Michael Phelps set the record for most gold medals in a single Olympics, winning his eighth gold medal of the 2008 Beijing Summer Olympic Games as a member of the winning American 4x100 medley relay team. Australia's Sally McLellan surprisingly won a silver medal in the women's 100 metres hurdles at the Beijing Olympics. Sally's pure joy and refreshing celebration at the end of the 100 meter hurdle finals with bronze medalist Priscilla Lopes-Schliep of Canada has touched many. In Australia, she has become the darling of the country and achieved instant celebrity status. While winning the Olympic 400-meter gold medal has not sunk in yet, Christine Ohuruogu of Great Britain says she is 'very happy.' Christine Ohuruogu is the first British woman to win the Olympic 400 meters. Olympic Record breaking and double gold medal winning Britta Steffen of Germany says she swam the first 50 meters of the 100m Freestyle final with her eyes closed to avoid being distracted by her opponents. Having made Olympic history, Great Britain's cycling star Chris Hoy said he felt like he was in a dream. Chris Hoy became the first British athlete in 100 years to win three gold medals in a single Olympics. During the 2008 Beijing Summer Olympics, Chris Hoy won gold medals in the men's sprint, the team sprint and the Keirin event. Great Britain's Cycling Gold Medalist Victoria Pendleton: "It's Something Completely Special"
Victoria Pendleton defeated Anna Meares of Australia to earn her Olympic gold medal in the women's track cycling sprint finals. The 27-year-old explains in her interview that without the disappointment of the 2004 Athens Summer Olympics, she wouldn�t have modified her training program for the 2008 Beijing Summer Olympics. After winning a record eight gold medals in one Olympics, U.S. swimmer Michael Phelps says he was partially motivated by people saying no one could ever duplicate Mark Spitz�s achievement. Nelson Evora won the men's triple jump at the 2008 Beijing Summer Olympics. Evora won the gold medal with a jump of 17.67 meters beating silver medalist Phillips Idowu of Great Britain by 5 centimeters (17.62 meters). Leevan Sanders of the Bahamas won the bronze medal with a triple jump of 17.59 meters. This is the first Olympic Gold Medal in 12 years for Portugal and only the third gold medal for Portugal in Track & Field ever. After surpassing Mark Spitz' performance of winning seven Gold medals in one Olympic Games with eight of his own, Michael Phelps says that he is ready to get more gold medals at the 2012 Summer Olympic Games in London. Yelena Isinbayeva -- who has dominated women's pole vaulting since wining at the 2004 Athens Summer Olympics -- said she did not want to disappoint her fans by only winning the gold medal and not breaking her own world record at the 2008 Beijing Summer Olympics. Despite finishing second in the 2007 World Championships (Osaka, Japan) with a time 9.91 seconds, Derrick Atkins is not considered a favorite to medal in the 100 meters at the 2008 Beijing Summer Olympics. Leading up to the 2008 Beijing Summer Olympics the focus on the 'World's Fastest Man' Title has been on Tyson Gay, Usain Bolt and Asafa Powell. Derrick Atkins makes a great case as to why he should not be merely an afterthought in the Men's 100 meters. One month after losing to fellow American LaShawn Merritt in the US Olympic trials in July, two-time Olympic and World Champion 400 meter runner Jeremy Wariner talks about Merritt, his mental preparations for the event and how he plans to defend the 400m gold medal he won in Athens. Women's 200 Meter Champion Veronica Campbell-Brown of Jamaica: "Everybody in the Final is a Contender"
Olympic 200 meter Champion Veronica Campbell-Brown explains that Allyson Felix will be her main rival for the Olympic crown but also that everybody who makes it to the final has a good chance of winning. American 100 Meter Sprinter Darvis Patton: "Usain Bolt is a Freak of Nature"
America's Darvis Patton shares his thoughts on his chances of medal at the 2008 Beijing Summer Olympics ahead of the 100 meter final on August 16. His expected competitors for the gold medal are World Champion Tyson Gay, former world record holder Asafa Powell and Jamaica�s Usain Bolt, who Patton has described as a �freak of nature�. American Pole Vaulter Jennifer Stuczynski: "I Will Clear the Same Heights as Yelena Isinbayeva"
America's Jennifer Stuczynski says it's only a matter of time before she is clearing the same heights as the Olympic and World Record holder Yelena Isinbayeva of Russia. With 3 consecutive victories on the Grand Prix Circuit in the Men's 100 meters, Asafa Powell appears to have emerged as the favorite to win the Men's 100 meters at the 2008 Beijing Summer Olympics. For French Cyclist Jeannie Longo the 2008 Beijing Summer Olympics will be her seventh time competing in the Olympics. Even though she's almost a half-century old (born October 31, 1958), Longo is still setting her sights high. Swiss tennis ace Roger Federer has lost his world number one ranking but is gunning for Gold in the 2008 Beijing Summer Olympics tennis championship. As one of Switzerland's main medal hopes, he will be carrying his nation's flag during the opening ceremony on Friday. The anti-doping effort at the Beijing Summer Games will be more extensive than ever, says the International Olympic Committee (IOC). More than 4,500 tests will be administered, amounting to 25 percent more than those conducted in the 2004 Games in Athens and 90 percent more than the number of tests in Sydney in 2000. An experienced American team featuring 15 Olympic medalists, 31 World Outdoor Championships medalists and 11 individual outdoor American record holders will represent the United States in track & field competition at the 2008 Olympic Games in Beijing, China. Yelena Isinbayeva is considered the favorite for the upcoming Beijing Olympics (August 8 - 24). She won the 2004 Olympic Gold Medal with a new World Record (then 4.91 m). On July 22, 2005, Yelena Isinbayeva became the first female pole vaulter to clear 5.00 metres. NBC Universal, broadcasting its record 11th Olympics, will present an unprecedented 3,600 hours of Beijing Olympic Games coverage, the most ambitious single media project in history. American sprinter Tyson Gay recently made headlines for his 9.68-second win in the 100-meter dash during the Olympic trials (June 29, 2008). Tyson Gay is considered one of the favorite contenders for the upcoming Beijing Olympics (August 8 - 24). Since establishing the world record of 9.72 seconds in the 100-meter race at the Reebok Grand Prix on May 31, 2008, Jamaican sprinter Usain Bolt is one of the most eagerly-awaited athletes of the upcoming Beijing Olympics.